In the aftermath of the killings at the Tree of Life Synagogue in Pittsburgh, it’s appropriate to reflect on how Jesus spoke of righteousness. Jesus said: “Seek first the kingdom of God and his righteousness – δικαιοσύνην αυτού – and all these other things will be added to you.” He also said: “Beware of practicing your righteousness before other people in order to be seen by them.” Or, your righteous deeds – δικαιοσύνην again. In the very next sentence he says, “Thus, when you give to the needy, sound no trumpet before you.” The Greek word is ἐλεημοσύνην – acts of mercy, compassion. Like God shows to us. Kyrie eleison! Righteousness cannot be separated from ἐλεημοσύνην. In the Lord’s Prayer we say “thy will be done on earth as it is in heaven.” God’s will in heaven is always the reflection of God’s righteousness. So when we show mercy ἐλεημοσύνην, we are reflecting and sharing in God’s righteousness in heaven. His will is done on earth as it is in heaven. Yesterday an evil act was committed by an evil man against people gathered for prayer and worship on Shabbat. The crime has been labeled a hate crime, anti-semitic. And it was that. But there is a deeper story that perhaps you haven’t heard. This Jewish congregation, Tree of Life in Pittsburgh – a beautiful name for a congregation – this Jewish congregation is one of over 300 synagogues across the United States that are part of HIAS, the Hebrew Immigrant Aid Society, which was formed in 1881 to help Jews fleeing from pogroms in Russia and Eastern Europe and later from Nazi Germany. It’s the oldest refugee agency in the world, and today they help non-Jewish refugees, even Muslims. Partner synagogues help refugees from various countries resettle in American communities. Just as Catholic Charities do and as our parish did in the late 80s and early 90s with refugees from Ethiopia, Eritrea and Eastern Europe. The President and CEO of HIAS, Mark Hetfield was interviewed yesterday on CNN. I was struck by something he said: “We used to be an organisation that welcomed refugees because they were Jewish, and today we welcome refugees because we are Jewish.” Helping refugees is ingrained in their DNA because Jews themselves were refugee people! 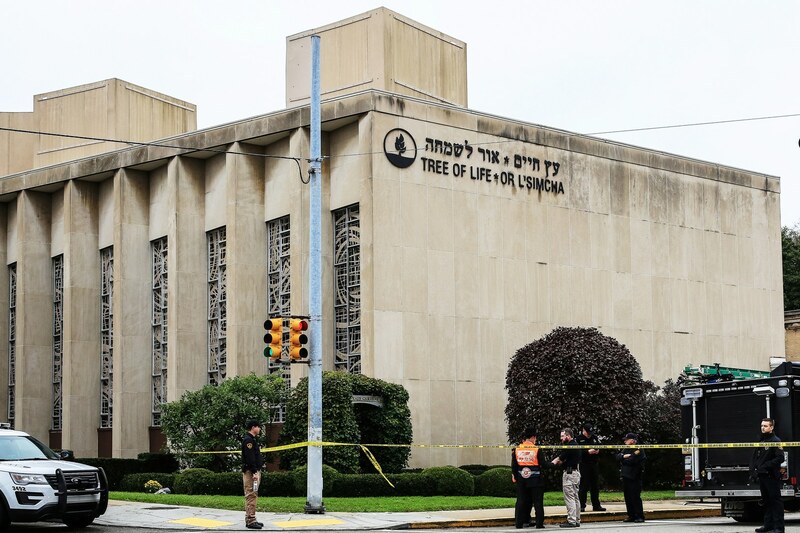 In his social media posts, the shooter often attacked Jews and Muslims together and seems to have singled out HIAS in his last hateful messages, because they bring refugees into the country who, according to him, are killing us. I don’t know who he meant by that. His final social media post: “I can’t sit by and watch my people get slaughtered. Screw your optics, I’m going in.” The shooter was so filled with hatred that he could not tolerate Jews helping Muslims and other refugees. All his hatreds came together into one act of multiple murders. Jews helping Muslim refugees. This, to me, is an extreme example of what Jesus meant by righteousness. The shooter is evil. Let’s not spend any more time talking about him. The real matter for us today is this question of righteousness. Jews who have been mistreated and persecuted for thousands of years are helping others who are fleeing persecution and war – because they have not forgotten who they are and what they have endured over the ages. Today Greeks celebrate OXI Day, commemorating the day in 1940, when early in the morning the Greek prime minister Metaxas rejected the ultimatum issued by Benito Mussolini. As day dawned on October 28th, Greeks all over the country took to the streets shouting Ohi, No!. Perhaps because of its own history Greece was more willing to assist refugees from the Middle East than most other European countries. This is the righteousness of the kingdom at work among human beings. Will any Christian say today that those Jews who were killed yesterday are not going to heaven because they don’t believe in Jesus? They might not believe in Jesus, but they do the righteousness that Jesus taught. They are his people, and we would do well to follow them in acts of righteousness. Kyrie eleison we sing hundreds of times in our services. But do we show ἐλεημοσύνην? Yes, it’s dangerous to show mercy, to be righteous. 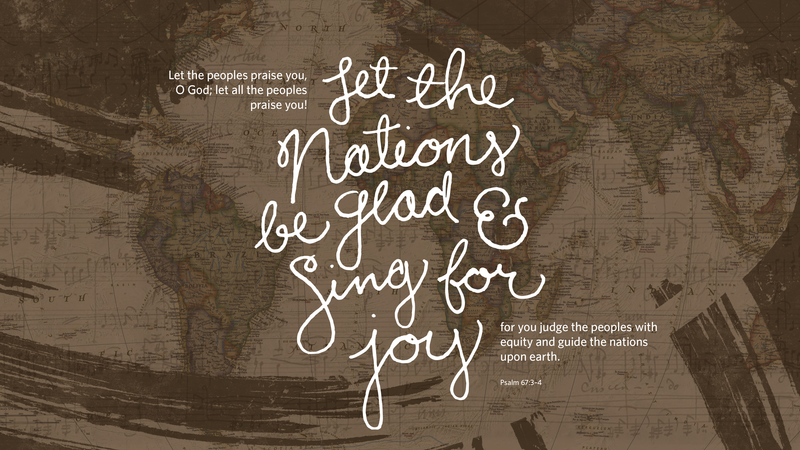 What do we sing in the Beatitudes? Blessed are those who hunger and thirst for righteousness – δικαιοσύνην. And, Blessed are they who are persecuted for the sake of righteousness, for theirs is the kingdom of heaven. Jesus was not a Christian; he was a Jew. And Christians would do well to learn some righteousness from our Jewish brothers and sisters. May their souls rest in the kingdom which Jesus promised to all who are persecuted for the sake and cause of righteousness. Categories: Sermons | Tags: righteousness, Tree of Life Synagogue | Permalink. I quote the NRSV rendering of this verse, because David’s heart seems to have initiated Davi’d desire to dwell in the house of the Lord, where he will behold the beauty of the Lord (yesterday’s verse). It is true of human nature in general that our desires are most genuine and most fruitful when they arise from within our deepest inner being – which in biblical language is the ‘heart’. But our hearts are divided, especially in our advertising-dominated world. When we talk about our ‘heart’s desire’ we often mean nothing more than something we saw on an afternoon talk show or online. That’s not what ‘heart’ means in the Bible. Heart in the Bible – as in Psalm 27 here – means the undivided self. Thus Jesus can say, “Blessed are the pure in heart for they shall see God” (Matthew 5:8). We sing this verse every Sunday in the Liturgy, as part of the Beatitudes. Hearing, singing, responding – this is the dynamic of David’s psalm. And it is the dynamic of Christian worship! David heard his heart, he sang his psalm – and he responded, he took action, he sought the face of the Lord. He went into the house of the Lord. And he found confidence not to be terrorised by his enemies. (Remember, David was a warrior and a king. Who said warriors and kings can’t also be poets?) Read the entire psalm again and see this dynamic at work in David’s stormy life. I know for myself how easy it is to talk the right words, but do nothing more than talk. Life is full of honourable intentions. I can’t count the times that a parishioner feels it necessary to tell me, “You’ll see me in church soon.” But I still don’t see them. But the real matter is not whether I see them “in church” but whether God sees them. And whether they see the face and beauty of God! As we move into an increasingly non-participatory form of Christianity, people think nothing about separating themselves from the corporate worship that is the essential task of the church. Kids sports can only suffice as an excuse to a point. At some point the question needs to be asked: What does your heart tell you? Is there still any warmth in your heart for God? Is your Christian faith just words? Categories: Bible Reflections | Tags: David, face of God, Psalm 27, undivided heart | Permalink. 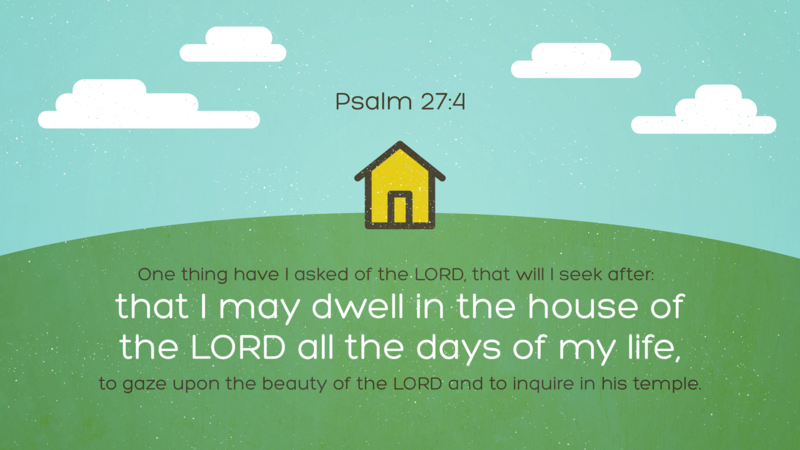 Psalm 27 is one of the highest points of inspiration in the Bible. The verse highlighted today provided the text for a very catchy contemporary Christian song I first heard many years ago and I still often sing it to myself. I’m singing it right now as I write this, but silently as it’s 2:00 am. I prefer the translations that say “behold the beauty of the Lord” instead of “gaze upon the beauty of the Lord.” “Behold” conveys more of the sense of awe. for you have been my helper. and let your heart take courage; wait for the Lord! What a marvelous expression of confidence. What a wonderful vision of life lived in full awareness of God. Our verse today tells us that David’s only desire is to live in the house of the Lord so he can behold unceasingly the beauty of the Lord. The Lord is indeed beautiful. Have you ever used the word ‘beautiful’ to describe God? How different from the usual ways we refer to God. David not only wants to live in the house of the Lord, but he wants to converse with God, “to inquire in his temple.” It reminds me of Jesus when he was twelve years old and his parents found him in the temple at Jerusalem conversing with the priests and teachers. Do we listen to our hearts, or do we force our hearts to obey our minds? David listened to his heart, and his heart told him, “Come, seek his face!” And David obeyed: “Your face, Lord, do I seek. Do not hide your face from me.” Do you seek the face of the Lord? Listen to your heart, it will guide you to seek the Lord “in the land of the living.” The heart and soul of life lived in Christ is in this Psalm. And it invites every one of us to the land of the living. Although God does not dwell in any earthly temples built by human hands, there is a unique divine presence in every sacred place and house of worship – yes, in our ‘temple’ too, on the corner of Pleasant and Park Streets in Portland, Maine. My own conversion to personal Christian faith did not happen at a Billy Graham crusade or some miraculous experience. No, my conversion began (it began!) when I stepped inside the Cathedral at Chartres, France, in July of 1978. The churches of Paris, including Notre Dame, were impressive but left me unmoved. Chartres was different. I spent two days inside that huge Gothic church, studying every stained glass window, every statue, reading everything in my detailed guidebook and twice joining the guided tours of the most amazing tour guide in the world, Malcolm Miller. As far as I know he is still there, doing his daily tours, full of insight, full of theological depth and understanding and a master communicator of his deep knowledge. And there in the great space of Chartres Cathedral I experienced the beauty of the Lord. The space itself conveyed the beauty of God, and I believe something similar happened to David when he was in the temple. As a result, he desired to be in the presence of that beauty all the days of his life. Malcolm Miller has spent 60 years in Chartres Cathedral by now, guiding countless visitors to an appreciation of magnificent, beautiful Christianity. One of the most moving stone carvings at Chartres is that of Christ cradling the head of Adam. How can one look at this carving and not be overcome by the incredible divine humanity and infinite compassion of the Lord. But it’s only one of many hundreds of carvings at Chartres, a luminous place, a place of spiritual transformation – as long as you allow yourself to linger and not be on a tour bus. So when I read David’s Psalm 27 I am drawn to memories of Chartres and memories of chapel at St. Vladimir’s Orthodox Seminary. The beauty of the Lord is indeed something we can all experience. And we can experience it wherever we gather to worship the Lord. But you have to linger, you can’t be in a hurry. And you have to be quiet in your spirit so God can speak to you in the silence: Now there was a great wind, so strong that it was splitting mountains and breaking rocks in pieces before the Lord, but the Lord was not in the wind; and after the wind an earthquake, but the Lord was not in the earthquake; and after the earthquake a fire, but the Lord was not in the fire; and after the fire a sound of sheer silence (1 Kings 19:11-12). God was in the silence. The beauty of the Lord is best encountered in the silence. Categories: Bible Reflections | Tags: Chartres, Malcolm Miller, Psalm 27 | Permalink. My Logos Bible software posts a Bible verse every day as a color slide. I use this daily verse to compose my own reflection on it. 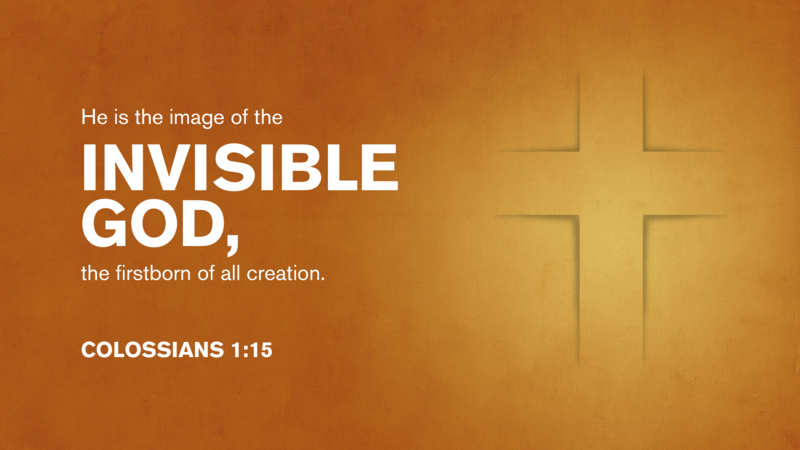 So when I logged into my Logos account early this morning, I found today’s highlighted verse is one that I referred to yesterday when I reflected on Jesus as the icon/image of the invisible God (Colossians 1:15). 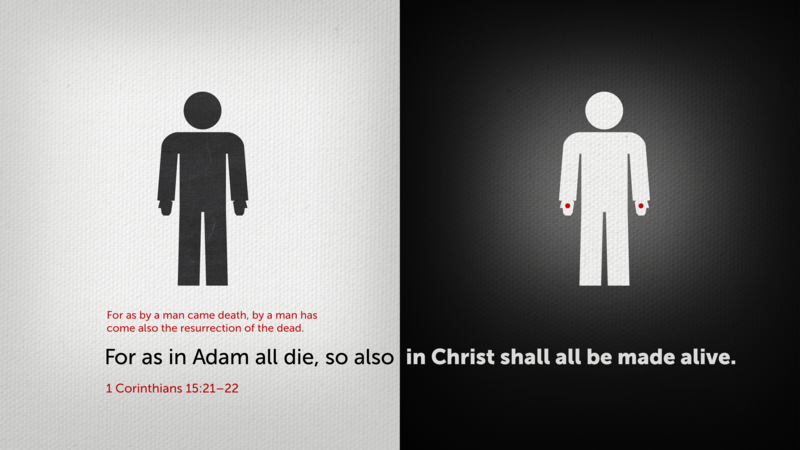 Today’s verse draws a sharp contrast between Adam and Christ. As any mention of Adam needs some explaining, it is incumbent for me to do so here. Just like yesterday, the discussion has to be a bit on the theological side, as necessitated by the verse itself. Adam was, according to Genesis chapters 1 & 2 the first human being created by God. And Eve was created from Adam’s rib, according to Genesis 2. Male and female God made humanity; in his image and likeness he made them (Genesis 1:27). The story of origins culminates in Genesis 3, the story of the fall, where Adam and Eve transgress against God’s commandment and are sent out from the garden where they were created. The most crucial result of the fall was that human beings became subject to death. Presumably there would have been no death if they had not transgressed, and they would have remained in the garden. The story, of course, is archetypal and no one who has gone to school and knows anything about science can accept the story as anything more than a poetic explanation for death and sin. I have never taken the story literally. It is simply impossible for me as a former scientist to accept the story of Adam and Eve literally. It’s a powerful metaphor of human sin and mortality, but impossible as fact. Sorry if that offends any literalists. And Paul, of course, takes the story literally and states the obvious: Death came through Adam, but resurrection and eternal life comes through Christ. The Fathers of the Church (why are there no Mothers of the Church when we talk about theologians?) were inspired by such statements in the New Testament and were motivated to call Jesus the “Second Adam”, in the sense that Jesus undid the fall and reversed the sentence of death that fell upon humanity. As I said, powerful stuff – regardless of whether you take the story literally or not. But here is a conundrum that arises in my mind. Let’s for the sake of argument take the story as factual history. Some of the Fathers of the Church saw dimensions in the story that Paul did not appreciate or conceive. Some of the Latin Fathers saw the fall as a felix culpa, a “happy fault”. Among the Greek Fathers, Irenaeus of Lyon saw Adam and Eve as childishly immature in the garden, before the Fall – with potential for growth, to be sure, but immature nevertheless. Here is my question. If Adam and Eve had not fallen and had remained in the Garden, would there have been any civilization? Would there have been a Homer or Socrates? Would there have been a Parthenon or the pyramids of Giza? or the Sistine Chapel? Would there have been a Shakespeare? a Beethoven or Mozart? a Tolstoy? Ella Fitzgerald or the Beatles? Sorry if I’m so eurocentric in my examples. I’m not one of these new folks who put down the achievements of western civilization. Without the felix culpa, we would have none of the great achievements of human civilization – nor, of course, any of the evils, like the Holocaust or 9/11. We accept the evils as manifestations of the dark side in human coexistence, because the manifestations of light and beauty are so much grater and more enduring. This is the great tradeoff of human history. But the greatest gift of the fall is that it made possible the coming of Christ in our midst. We look at Christ and we can’t imagine life without him. And I prefer to focus on the felix culpa version of the Fall. Because it gave us civilization in all its great achievements. And it gave us Christ, who brings gifts and promises greater than anything Adam and Eve received in the proverbial Garden. We’re not in the Garden. Thank God for that. If we were still in the Garden we might still be Irenaeus’ immature children. We’re in a magnificent place called Planet Earth! Can we start treating it as a garden of delight and take better care of it? That would be another glorious result of the felix culpa. Categories: Bible Reflections | Tags: 1 Corinthians 15:21-22, Adam, felix culpa, Second Adam | Permalink. Most people today don’t believe in demons and demonic possession. Yet, I claim that today’s Gospel reading is even more relevant today than it was 2,000 years ago. That’s because we don’t live in the age of demons; we live in the age of demonization! Yes, we demonize people; we demonize individuals we don’t agree with; and we demonize whole groups of people. And the greater tragedy is that people don’t want to stop demonizing someone else or another group because they need a scapegoat, someone to blame. So even when the facts don’t agree with them, people invent lies or simply refuse to believe what’s in front of them. That’s what happened with the Jews in Germany and Russia and other European countries in the previous two centuries. Fake documents were created – like the notorious “Protocols of the Elders of Zion” – in order to support the demonization of Jews. And all this led to the Holocaust, the darkest act of evil perhaps in all human history. In today’s Gospel reading, the local people of the village had cast out this man. He was demonized – or, perhaps they demonized him. Jesus released him, liberated him – but the villagers were not happy. Who would they demonize now? Oh, wait, they got it. They demonized Jesus, and forced him to leave their area. But Jesus asked the man to stay behind, among his own people. The man they demonized now stayed behind to be their healer. A beautiful conclusion. Did he succeed? We don’t know. Human history would tell us that the strategy of staying behind to heal a village or a country rarely has succeeded. If you want a description of what it means for Christ to live in you, you can’t do much better than this. Compassion and kindness in Paul’s mind are inseparable from humility, meekness and patience. Knowing our own neediness prevents us from judging someone who needs our compassion and kindness. Knowing our own neediness of God keeps us from becoming arrogant in our attitude toward others. The meek shall inherit the earth, not the arrogant. And those who are patient – a tough thing to be in our instant gratification society. But if we learn to be patient in our own healing we will be patient with others, “forbearing one another…forgiving each other other…And above all these put on love, which binds everything together in harmony.” Community is the training for all this. And unless love binds everything here where it is easiest, how can we bring love and compassion to the world out there that needs love and compassion so desperately? Categories: Sermons | Tags: Colossians 3:12-17, demonization, Gerasene demoniac, Holocaust | Permalink.